Are you interested in a career at Kmart? Owned by the Sears Holdings Corporation, the mass merchandising subsidiary operates full-line and specialty retail stores in 47 states and online. Job opportunities are available in a diverse range of categories, including sales associate, customer service, automotive, repairs, loss prevention, member services, human resources, and management. As a favorite U.S. retailer, Kmart stores have played a vital role in the growth of the modern department store. In 1899, Sebastian Spering Kresge opened a five-and-dime store in Detroit. By 1912, he had over 85 stores, earning more than $10 million annually. His low prices appealed to American shoppers, and during the coming years of war and depression, Kresge continued to offer value, and most importantly, jobs to communities. To entice shoppers, Kresge was one of the first retailers to implement newspaper advertising. He added stores that sold items for under $1, and overtime Kmart became one of the most successful department stores in the country, operating 2,171 stores at its height. In 2005, Kmart Holding Corporation merged with Sears, Roebuck, and Co. to become Sears Holdings Corporation, now ranked 18th largest U.S. retailer. With over $22 billion in annual revenues, the company continues to strive for new, innovative ways to expand its presence, both in stores and online. As a result, Kmart is always hiring employees in many different capacities. 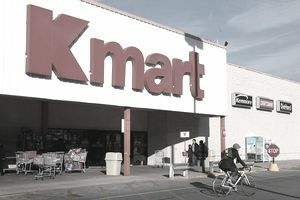 With well over 1,000 openings listed on its jobs search engine, Kmart is always offering ample employment opportunities. Applicants simply search by location and keyword or job title. After finding the position that matches their criteria, the online application process begins. Additional Kmart employment information, including store job openings, Kmart employment application information, career information, and how to apply online is available at Kmart.com and in Kmart stores. The Kmart online application and hiring processes are handled through the Sears Career Center. You can apply online for the hourly store and distribution jobs and most other positions at Kmart and other Sears Holdings Corporation subsidiaries. All applicants have the option to sign up for Kmart’s Talent Network, which sends email alerts with new job postings and relevant communications at Kmart, including job fairs. Any time a location is hiring for a position that aligns with what the applicant is looking for, Kmart will notify them. During the job application process, applicants must answer a series of questions pertaining to prior work history, education, and employment availability. Candidates will also confirm they meet the minimum age requirement (18 years old) and can legally work in the U.S., in addition to other necessary questions that determine their eligibility for that position. Applicants may also submit a resume and cover letter – a critical action to take for serious candidates. Once the minimum qualifications are verified, applicants will take an online assessment test. Military candidates can search listings for job opportunities and submit a resume online via Sears Holdings Corporation. There are links to a skills translator to help you find the right position, leadership opportunities, technology careers, and benefits. Kmart takes great pride in the variety of benefits in which employees can enroll. The lengthy list includes medical and dental plans, an associate discount program, retirement savings plan, paid vacation and holidays, life insurance, disability income, adoption assistance, dependent care assistance, and employee assistance. Associates may also take advantage of Kmart’s Home Office Benefits, which includes an on-site fitness center, daycare, wellness center, cafeteria, and a flexible work schedule. If you're interviewing for an hourly job, wear a business casual outfit that is neat, clean and well-fitting. A button-down shirt with khakis or slacks is an appropriate outfit for men. For women, think chic, coordinated separates, like a skirt or slacks paired with a blouse. Candidates interviewing for a position in management or leadership should wear more formal attire, such as a suit. Irrespective of the position the candidate is interviewing for, it is critical to dress for success if you are serious about getting hired. This unspoken rule applies to designer stores, department stores, company stores, and large retailers.